Finance Magnates looks at the sad statistics and tries to figure out the causes of forex brokerage demise. The history of the retail forex industry starts in the late nineties. Since then, some companies have grown to positions of hegemony while others quickly faded away, leaving no legacy behind. Finance Magnates takes a look at the industry, trying to understand the lifecycle of forex companies and the hazards that they face. As with many popular business theories, the lifecycle theory has roots which can be traced. According to popular opinion, the first footprints of this theory can be seen in the works of Mason Haire, who in 1959 published “Modern Organization Theory”. He was one of the first to notice that organizations evolve in a way which can be described as a path, a path which governs the evolution of most organizations. The others were W.W. Rostow and Roger Penrose. Dennis C. Mueller is another expert to whom lifecycle theory is often attributed. In 1972 he published “A Life Cycle Theory of the Firm”. Today, the lifecycle of a company is believed to have many stages, although experts differ on the exact number. To boil it down to the simplest possible definition, the lifecycle of a company in the forex industry can be described by the following stages: growth, maturity, decline (ending in bankruptcy). 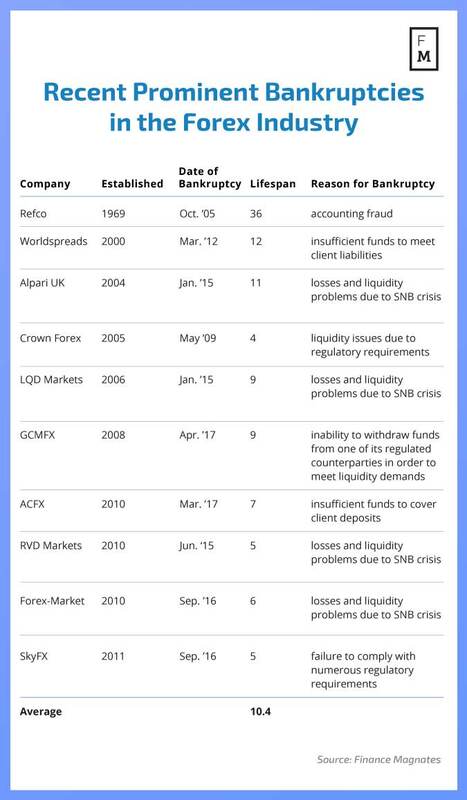 Bankruptcy is the worst case scenario for any business, and it happens in the FX industry too. Finance Magnates conducted some brief research on this subject which gives a taste of how the FX industry deals with bankruptcy. We used analytical and marketing data to reach our conclusions. We noticed that in 2014, roughly 1.8% of brokers went out of business, while in the last 2 years, the share of bankrupt brokers has reached a level of around 17% – that’s 1 out of every 6 brokers. Understanding the typical lifecycle of an FX company remains a challenging task. Firstly, the nature of the offered product is unique, and does not leave much room for brokers to create new products. Secondly, the rules of engagement are very often altered, and regulations force firms to make decisions which would not be taken were the market forces of supply and demand the only drivers. Lastly, the retail FX industry itself is relatively young. Firms are still around which actually invented some of the key products that the industry is based on. For all the new firms which aim to replicate the success of the largest market players like Plus500 and CMC Markets, there is left only the path of hard work, discipline and competitive trading terms, combined with superb customer care and constant rivalry.